You Are Here: Home > What is Honda Certified? 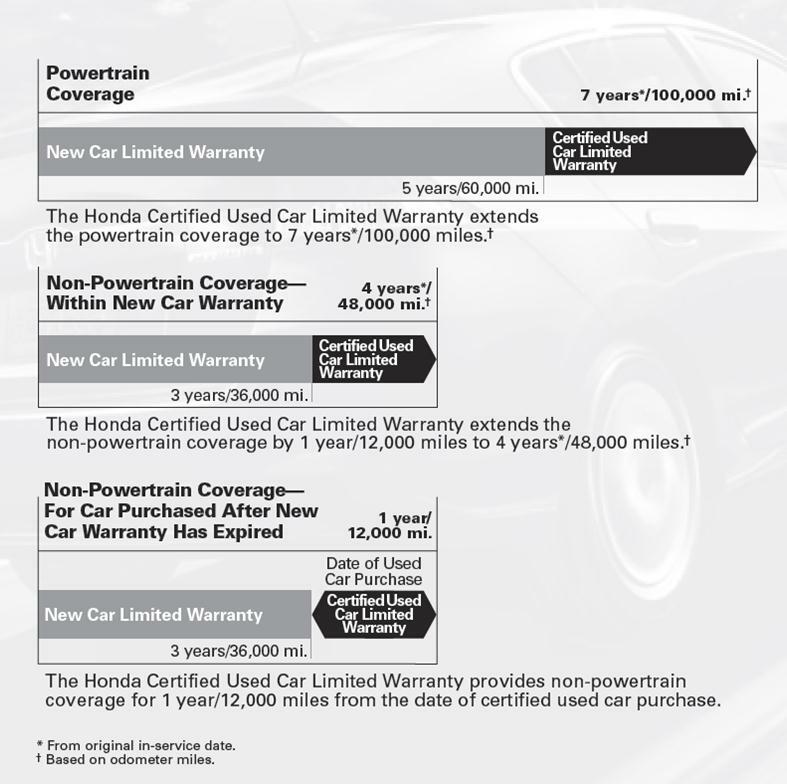 Every Honda Certified Used Car comes with a free CARFAX® Vehicle History Report as standard equipment. Since its inception in 1986, CARFAX has built a database of more than 7-billion records that document whether a vehicle is a lemon buyback, has been salvaged, damaged by a flood, used as a taxi or rental car, had its odometer rolled back, as well as other pertinent facts that may affect the vehicle’s safety and value. In addition, CARFAX will buy back any vehicle that turns out to have a severe problem reported by a state Department of Motor Vehicles that is not included on its Vehicle History Report. * It’s a guarantee that makes buying a used car virtually as risk-free as buying a new car. By going with a Honda Certified Used Car, you’ll have access to financing through Honda Financial Services. Also, depending on your situation, it might be to your advantage to lease your Certified Used Honda. Consult with your Honda dealer to explore your full range of financing options and determine which is the best for you. Buying a used car is virtually as risk-free as buying a new car. Take delivery with peace of mind! Hear more of what you love, coast to coast! Customers who purchase any Honda Certified Used Car with factory-equipped XM® Radio will receive a complimentary 90-day trial period at time of purchase. With over 150 channels and commercial-free music, XM Radio provides the soundtrack to the most distant destinations. Please ask your dealer if your vehicle has factory-equipped XM. Required XM Radio subscription sold separately after 90-day trial period. Subscriptions are governed by the XM Customer Agreement available at xmradio.com/service terms. Other fees and taxes apply after trial period; see XM Customer Agreement for details. Fees and programming subject to change. Service not available in Canada, Alaska, or Hawaii. XM Services are dependent on XM broadcast capabilities. ©2010 SIRIUS XM Radio Inc. SIRIUS, XM and all related marks and logos are trademarks of SIRIUS XM Radio Inc. and its subsidiaries.